Attending a live golf tournament is quite different from TV, without a leaderboard, it's harder to follow the action. While attendants that follow every group at a PGA Tour event carry placards with the names and scores of the players in the group, to know how players are doing in the grand scheme of the tournament, a leader board is required. The leader board shows the top players, their scores and what hole they are playing. The leader board's primary role is to inform those who look at it about the players on the course, and how they are playing, but in order to best convey that information it is also important for the board to carry some information about the course. Across the top of the board, the hole numbers are listed, beneath which the par of each hole is displayed. This allows player scores to be updated hole by hole, and for those reading the board to see the number and the par of the holes remaining for a player. The players' names run down the left-hand side of the leader board, with the top scorers for the event earning a place on the board. Most boards will hold between 10 and 20 players' names. 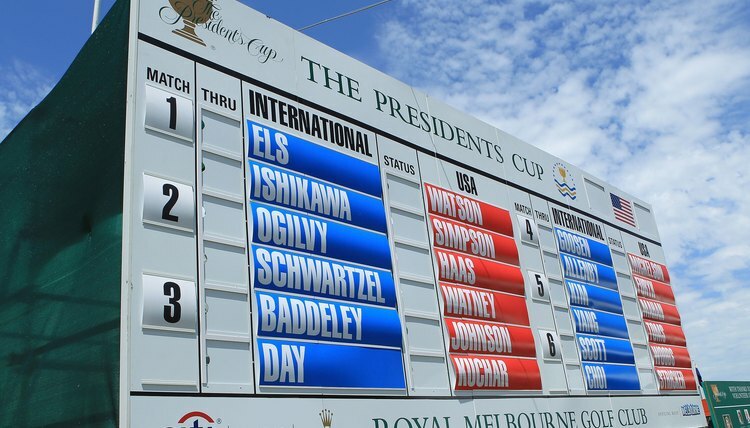 In addition to the names of each player, most boards will feature the players' scores coming into the round to the left of the players name, should it be the second day of the tournament or later. Rather than having to add space to the board to account for a plus sign or a minus sign next to any scores that are not even par, the boards use color to signify whether a player is over par or under par. While red may be bad on a balance sheet, it is something to aspire to on a leader board, as it has the same meaning -- the player is below zero, or par. Scores that are displayed in black signify that a player is over par for the number of strokes listed. When recording player scores, the score for each individual hole is not displayed under the column for that hole, as that would require viewers to add up those scores on top of the players opening position to determine their current score. Instead, the players cumulative score to par is shown. For example, if a player begins the final round 5 under par and birdies the first hole, they would have a red 6 placed in their first column. If they bogeyed hole 2, even though their score for the hole was over par, they would get a red 5 under hole 2's column, as they are still under par overall. While the leader board will maintain the top players in the tournament throughout the course of the day, it is not uncommon for players to be listed out of order. This is particularly common late in a round when there are many scores on the board for a player, and swapping the positions of 7th and 8th is not essential for the board to still show the state of the top players.